Update: This post may be confusing because of differences between measles cases (which didn’t drop until vaccination) and measles deaths (which did drop dramatically before vaccination was introduced). 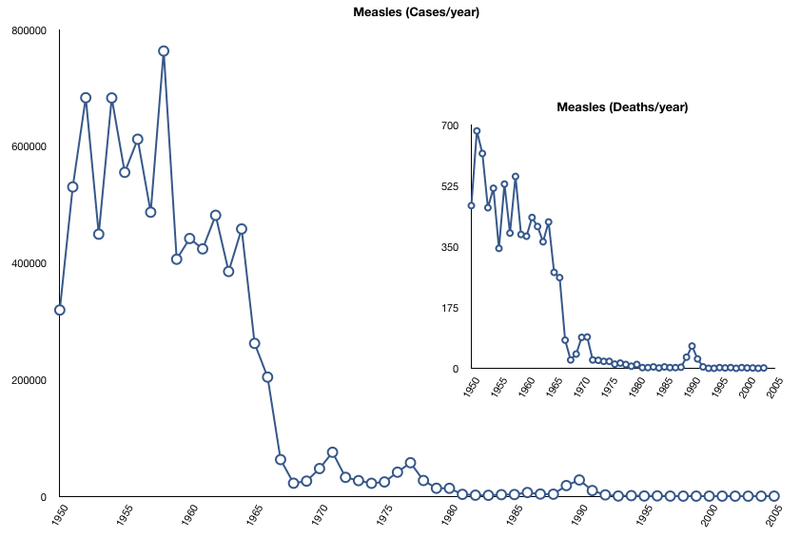 I’ve written much more about the drop in measles deaths, starting here: Measles Week, Part I.
There’s a claim running around the anti-vaccination circles that measles vaccination didn’t do anything because the disease had already dropped by 95% (or 98%) before vaccination was introduced. That claim is false, of course, and I don’t really expect that debunking it will make any difference, but here it is anyway. The post-vaccine data I’ve already shown, and I’ll repeat it here. This is measles in the US, after 1950. (Click for a larger version.) You can easily see where the vaccine was introduced. As I say, I don’t really expect this to convince the loons, but I know there are lots of people who are not loons, but who may be puzzled (or fooled) by the loons’ lies. Don’t take anyone’s word; check the original references. Your data on measles certainly support you. I wonder if you have a wider view on this issue (with respect to other infections). Evidently, the view that rising wealth – via nutrition and hygienic living conditions – greatly outdid all medical interventions in altering death rates from infection, was promoted particularly by one McKeown during the 1950s-80s. He published journal articles and a couple books. There are other essays on the topic out there. Somewhere in my education – not necessarily in school, but in fact I think it was – I encountered and absorbed this McKeown thesis, presented more or less as fact. McKeown was a physician whose historical work corresponded to a polemical position in favor of greater preventive care and “humanism” in medicine and less “technocratic” use of specific interventions. I looked up vaccine loonery in wikipedia for 20 seconds just to see how old it was. Apparently it goes way back, drawing in early times on austere theological notions that disease was a divine punishment for sin. I certainly can’t say that quarantine alone couldn’t have produced this, but it sure was one hell of a change. Eric — I’ve commented on the decline in Tb previously, here. One possibility is that the poorhouse institution inadvertantly acted as a quarantine mechanism for Tb patients and had a lot to do with the decline in incidence. The papers I reference make that argument, anyway. For nonscientist readers who might not get this from the context, I should add that I’m 98% sure that McKeown and friends were not actually against vaccines. (I’ve never heard of even one serious person who supports that view.) He merely thought the changes in living standards caused by the industrial revolution were significantly more important than vaccines were. And, again, even that much is probably much more false than true. I’m writing as a reader sympathetic to your main point about showing the effectiveness of vaccines. In fact, I came across your blog while doing research to try to persuade a beloved relative to vaccinate her kids. I have no scientific or statistical training and am wading into this completely as a layman. Anyway, what I wanted to ask you about was this: What do you make of this chart, from a UK NHS site, that pretty clearly shows that while reports of measles cases fell dramatically following the vaccine, measles deaths HAD fallen from more than 1000 in 1941 to around 100 (? hard to tell from scale) in the mid-1960s, just before the vaccine. 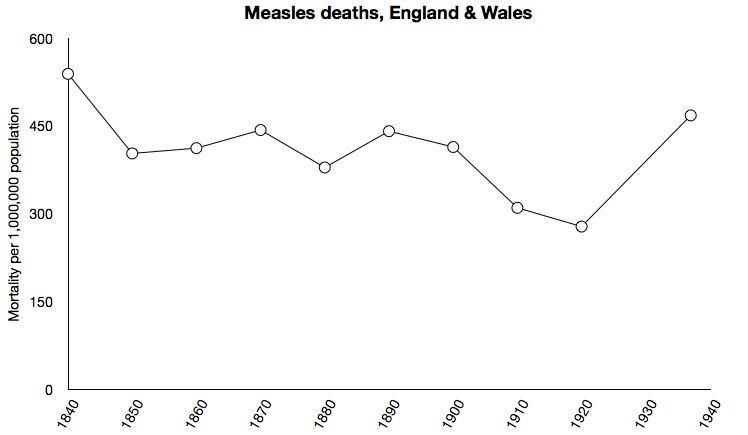 When I show this to my beloved relative, she will certainly point out to me that UK NHS data prove that measles deaths fell by more than 90% before the introduction of the vaccine. How would you advise that I respond to her? Hi, Peter. It’s a good question. It’s strictly a question of mortality rates, as you can see from the case numbers — the number of cases of measles remained fairly constant (accounting for epidemics) while the per-case mortality dropped precipitously. It started well before 1941, probably in the 1920s or so. The same thing happened in the US, rather earlier than in the UK. By far the most important reason was nutrition. Childhood nutrition (and childhood quality of life) really started to improve around the turn of the century, and nutrition is an enormous factor determining measles survival. This is still hugely relevant today; measles case-mortality rates in Africa are much higher than in the US or UK, for example, and nutrition status is the major predictor. American children in general had better nutrition than British, and that helps account for the earlier drop in measles mortality in the US. It’s important to note, though, that while the death rate did drop it had pretty much plateaued in the early 1950s — there was little or no further improvement in death rate for a decade before the vaccine was introduced, after which there was another precipitous drop in deaths that paralleled, this time, the drop in case number. I don’t think anyone argues that vaccines alone have been the cause for all diseases and all death reduction — I’ve tried to make that point in this blog several times, especially when talking about tuberculosis. Sanitation, nutrition, antibiotics, and quality of care are all parts of the story. But if you follow through measles death rates in multiple countries — I’ve shown data for China, Finland, Burkina Fasso, Mali, and Togo, as well as the US and the UK, introducing the vaccine at different times — measles vaccination has led to a rapid and dramatic drop in measles cases and in measles deaths. I have the CD from the ONS Office of National Statistics for deaths in England and Wales for 1900 – 1997. 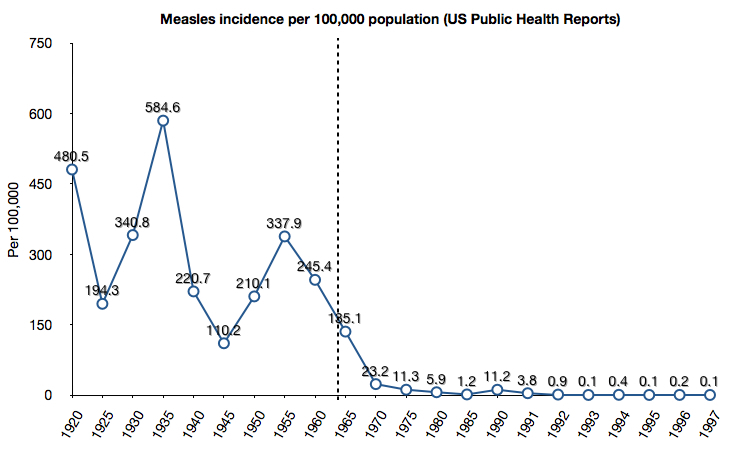 They clearly show a drop from 10,000 to 100 before the measles vaccine in 1968. More than 1,500 people die from Asthma. Research shows that the chances of developing asthma reduces significantly as a baby delays vaccination from 2 months to 4 months. The issue of measles in developing countries is a very complex one. The headlines a few years ago were ‘Measles vaccine program has reduced measles cases by 90% says the WHO’. Amazing? One thing I think most folk would agree upon is that dirty water is the one of the leading cause of death in developing countries and kills ten times more than measles, yet ten times more is spent on the measles vaccine program compared to clean water initiates. You would be well-served by learning a bit about the history of sanitary engineering in the US and Europe after 1915, particularly the introduction of slow sand filters and chlorine treatment units. What was really important was the separation of water and wastewater streams in large cities. Although wastewater treatment would lag by several decades (with interesting public health effects in its own right), it’s HIGHLY instructive to view the trend in infectious disease mortality and life expectancy, particularly in infants in the decades, after drinking water disinfection was introduced. It can be argued that the US general populace nutrition suffered with early 20th c. urbanization because of the lack of transportation infrastructure, other than rail. Recall that the Haber process and major farming mechanization didn’t make cheap agrochemicals available until after the mid 1930s. Sanitation had surprisingly little to do with the amazing drops in measles mortality in the early to mid 20th century. The full reasons remain unclear but nutrition, crowding, and probably (in Europe) demographic changes related to WWII probably were the most important. Why do you say that? I’m a firm believer in water sanitation because I work at both a water filtration plant and a waste water plant. All the research I’ve done leads back to four factors; 1)water, 2)food nutrition and rotting food, 3)access to medical care, and 4)personal hygiene. These factors are huge and simply cannot be ignored. I believe to ignore them is an attempt to hide them. I don’t for a moment detract from the importance of sanitation in the 20th-century health revolution; sanitation is a huge factor for many diseases. That’s why I said it’s surprising that sanitation probably wasn’t a major factor for measles specifically. Measles is spread by respiratory infection, and is incredibly contagious by that route, so measles incidence isn’t much affected by sanitation. Measles mortality (the case fatality rate) was probably a little improved by sanitation because there would be some impact from water-borne secondary infections, but again most of the measles mortality was more related to respiratory than water-borne infections. As I say, it’s surprising, but sanitation was probably only one of a myriad of factors that helped reduce measles case fatality rates, and was far from the most important of them. my little sister has measles but i have never had them. i have had all my jabs but will i still catch it? am i save being in the same house as her? Actually this is an incorrect display of measles figures. In 1912 the deaths-to-cases ratio in US was 2.551. By 1963 the ratio had dropped to 0.085. This is over 25 times lower before the vaccine was licenced. (And remember it of course took a while to get the population mass-vaccinated. After 1963 the deaths-to-cases ratio actually increased for some years, and after this, It settled around 0.04-0.1. Sure, the overall cases have come down a lot. So, I think it would be fair to say that the measles vaccine effect is not that dramatic as portrayed by many pro-vac people. And in for example England and Wales, the statistics tell that measles deaths fell by over 99 % before vaccinating started. In fact I discuss this very extensively, in a week's worth of posts, in the link at the very top of this page. how could you find data about measles UK deaths from the “Annual report of the Registrar-General for England and Wales, Volume 70”? I’m not able to access it.